Join us on October 1 to weave your FIRST tapestry project! The workshop is led by Tabitha Gilmore-Barnes of the Tabitha Gilmore-Barnes Studio. Designed for beginners, this workshop provides participants with education and instruction on designing and weaving their first tapestry project using a frame loom and tapestry bobbins. All participants are encouraged to bring graph paper, #2 pencils and eraser, colored pencils, scissors, metal fork, and a tape measure. 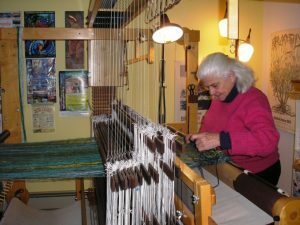 Participants will take home loom, bobbins, and enough wool to finish tapestry or will have cotton warp to rethread frame loom for their next project. The workshop fee, which includes all materials, is $75 for museum members and $100 for non-members. Pre-registration is required. The workshop is intended for those over the age of 18, but youth ages 10 -17 may take the workshop with parent participation. Please bring a bagged lunch and a snack. 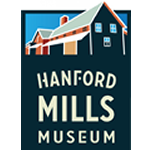 Register for the workshop online, by calling 607-278-5744, or by emailing brendanp@hanfordmills.org. Tabitha attended SUNY Fashion Institute of Technology’s Textile and Surface Design program, and took two workshops at The Tapestry Center (now defunct) in New York City. She graduated SUNY New Paltz with a B.S. in Art Education that included textile credits. She is a member of the Catskill Mountain Artisans Guild, in the Margaretville (Delaware County) Gallery and a member of the Buy Pure Catskills Guide since 2007 and has participated in the AMR Open Studios Tours since 2012, as well as the Roxbury Arts Group’s juried arts exhibits.